The strategy adjusts stock exposure by determining if the probability of recession is high or low. If there's an elevated risk of recession, stock exposure is rotated into bonds. The strategy is extremely low-cost to implement and has historically incurred less volatility than traditional buy-and-hold stock strategies. My macro model seeks to reduce stock exposure when there’s a high probability of a recession. This post is the second in a series of articles, I previously wrote about my trend model. Monitoring macroeconomic indicators to assess the probability of a recession. Adjusting stock exposure based on this probability. Rebalancing the model to reflect recent economic data. The macro model monitors three economic indicators: retail sales, industrial production, and the unemployment rate. These indicators cover three broad aspects of the economy: consumer spending, business activity, and the labor market. Each indicator also has 70+ years of data. Retail sales measure the dollar value of merchandise sold by retailers. Increasing retail sales indicates strong consumer spending and a strengthening economy. 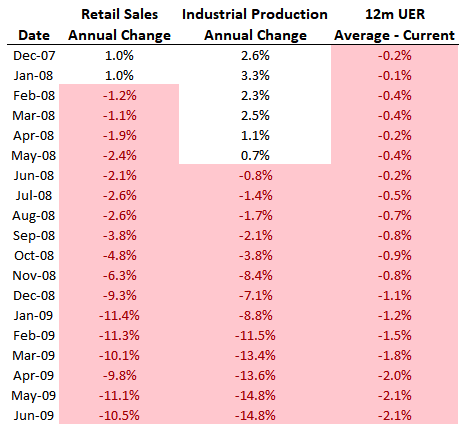 Historically, recessions have typically occurred when retail sales have fallen over the past year. This is shown when the blue line falls below 0%. Recessions are highlighted in grey. Industrial production measures the raw volume of goods produced by manufacturing companies. Increasing industrial production is associated with strong business activity for industrial companies. Historically, recessions have typically occurred when industrial production has fallen over the past year. This is shown when the yellow line falls below 0%. The unemployment rate measures the percentage of the labor force that is unemployed. A decreasing unemployment rate indicates a stronger job market. Historically, recessions have typically occurred when the unemployment rate has significantly risen. The macro model specifies a filter level for each indicator that’s historically been associated with a higher probability of recession. For both retail sales and industrial production, that level is when an indicator’s annual change is less than 0%. For example, if the annual change in retail sales is -2%, then retail sales have fallen over the past year. That would mean that consumers are spending less money and that part of the economy is weaker. Since the unemployment rate is a percentage rather than an annual change, its filter level is reached if the unemployment rate is higher than its 12 month average. For example, suppose the average unemployment rate over the past 12 months was 5.0%. If the current unemployment rate is 7.0%, the unemployment rate is rising. This means that more people are out of work and the labor market is deteriorating. The table below shows each recession since 1950 as well as whether an economic indicator was below its filter level. 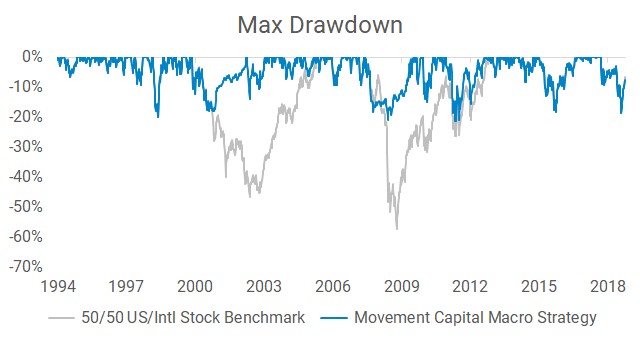 The drawdown column shows the max peak-to-trough price loss of the S&P 500 during each recession. The average drawdown is -21.7%. The goal of the macro model is to avoid some of this drawdown by reducing stock exposure during recessions. The table below shows how frequently each economic indicator has been below its filter level, both during and outside of recessions. For example, the annual change in retail sales has fallen below zero 70% of the time during recessions since 1950. This has only happened 15% of the time outside of recessions. The right most column shows the amount of time that at least two of the indicators have been below their filter levels. This is the main input for the macro model: If two of the three economic indicators are below their filter levels, there’s a higher probability of recession, and the macro model rotates from stocks to bonds. It’s helpful to look at one recession in isolation to see how the indicators influenced the model’s positioning. The table below shows each indicator during the most recent recession. When the recession started in December 2007, only the unemployment rate was below its filter level. A reading of -0.2% means that the unemployment rate in December 2007 was 0.2% higher than its 12 month average, indicating that the labor market was weakening. Both retail sales and industrial production were healthy in December 2007, with each pointing to increased growth over the prior year. This changed in February 2008, when retail sales fell and the indicator was below its filter level of 0%. Basically, consumers were starting to spend less money. In February 2008, two of the three indicators were below their filter levels. The macro model then rotated from stocks to bonds. The macro model’s baseline stock allocation is a 50/50 split between the same U.S. and international stock index funds used in my trend and passive models. Specifically, I use VTI for U.S. stocks and VXUS for international stocks. Both are low-cost Vanguard total market-cap funds. If there is a low probability of recession (one or zero indicators below their filter levels), the macro model is equally invested in both funds. If there is a higher probability of recession (two or more indicators below their filter levels), the macro model is invested in bonds. The bond fund depends on an investor’s account type. If the account is tax deferred (like an IRA), I use VGIT, an intermediate-term U.S. Treasury fund. If the account is taxable (like a brokerage account), I use VTEB, an intermediate-term municipal bond fund. I use these two funds, rather than a blended fund that tracks the popular Bloomberg Barclays Aggregate Bond index, to avoid taking credit risk when the macro model avoids stock exposure. I also use intermediate-term funds (rather than short-term or long-term bond funds) to avoid taking an active stance on the future direction of interest rates. I’ll explain this bond approach in a future article. The final step in the macro model is to rebalance the model to reflect recent data. Most active investors run monthly strategies based on data at the end of the month. I use a different approach for two reasons: 1) monthly strategies implicitly bet on the last day of the month to be the best day to rebalance, and 2) monthly strategies tend to underestimate volatility. The first reason is called timing luck and represents the amount of potential over or underperformance of a model solely due to its rebalancing date. The second reason why I don’t rebalance monthly is because monthly observations don’t capture volatility that happens within a month. For example, the max drawdown of international stocks in October 2008 based on monthly data is -22%. The same metric when using daily data is -34%. Monthly models observe fewer data points and underestimate volatility. My solution is to rebalance the macro model once per week but freeze the model’s stance for thirty days after a new position is initiated. This helps avoid wash sales in taxable accounts and also reduces back-and-forth trading. There’s one other aspect of the macro model. Economic data isn’t known in real time. For example, you can’t use February retail sales data in February since the data wasn’t released yet. Therefore, each economic indicator must be lagged so that a model is only using data that was available in the past. My macro model builds in this lag for each indicator. The macro model is now complete. It monitors economic data that has historically indicated a higher probability of recession, adjusts stock exposure based on this probability, and then rebalances once per week. The graphs below show the long-term simulated hypothetical returns and risk of the macro strategy relative to a passive benchmark. The benchmark is a 50/50 split between U.S. and international stocks, using the same funds from the macro strategy. Data includes fund expense ratios, slippage, and trading costs. A flat annual management fee of $3,500 is deducted from the macro strategy. This is my firm's flat fee for investment management, which includes an investment plan, portfolio management, and regular conversations. This macro model is a small part of the portfolio management component. I’ll be the first to say that investors should not expect 10.5% from this strategy (or any other) in future years. It’s important to not look in the rear-view mirror and extrapolate recent returns. Stock valuations are high on just about every metric and future stock returns will likely be lower than what the most recent cycle provided. That being said, the macro strategy is prepared to navigate future stock market volatility in a low-cost and systematic way. This macro strategy is one of the models I use in client accounts, with average macro allocations typically around 20%. I think it’s important for investors to not solely rely on one type of strategy, but rather be diversified across multiple approaches. I will outline the other models in future articles. Let me know if you have any questions in the comments below, I’m happy to help. Disclosure: I am/we are long VTI,VXUS. I wrote this article myself, and it expresses my own opinions. I am not receiving compensation for it. I have no business relationship with any company whose stock is mentioned in this article. Additional disclosure: Retail sales, industrial production, and unemployment rate data in the first three charts is sourced from the St. Louis Federal Reserve Economic Data (FRED) database. Recession dates in the fourth and fifth charts is sourced from "US Business Cycle Expansions and Contractions" from the National Bureau of Economic Research. S&P 500 data in the fourth chart is for price only returns of the S&P 500 index from Yahoo Finance. For the eighth and ninth graphs, returns shown are total returns that include dividend and interest reinvestment and are net of fund expense ratios and trading costs. Both examples start with $500,000. $875 is deducted from the Movement Capital macro strategy each quarter. The 50/50 benchmark is an interpolated series of returns based on VTI and VTSMX for U.S. stocks, and VXUS, VGTSX, and OIEAX for international stocks. The results are hypothetical simulated results, were not realized in an actual account, and are not an indicator of future results. 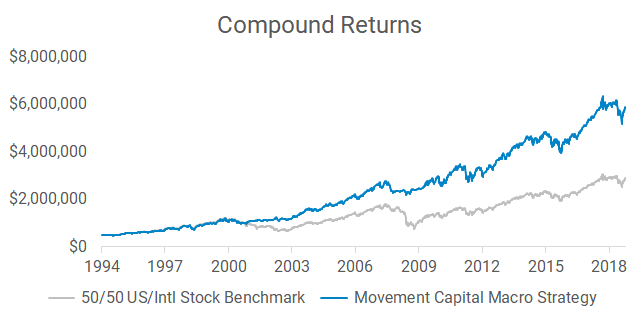 Movement Capital (MVMT Capital LLC) is a registered investment advisor. Advisory services are only offered to clients or prospective clients where Movement Capital is properly licensed or exempt from licensure. This article is solely for informational purposes. Investments involve risk and are not guaranteed. Movement Capital is not responsible for the accuracy, suitability, or completeness of any information on this website prepared by any unaffiliated third party. No advice may be rendered by Movement Capital unless a client agreement is in place.